With splendid texture and a sense of humor, Jay Bond’s opening sequence for the Canadian sitcom Météo+ features the sensual scrutiny of the weather, the worn, and the worn out. The clever combination of minimal motion-tracked graphics and the everyday blend nicely with a retrofit titillation; a throbbing jugular secretes sleepless sweat while a suggestively-shaped fan pushes the heat. For this opening title sequence, we decided to use a literal element from the show to reflect one of its strong underlying themes: things aren’t always what they seem and they rarely go as planned. 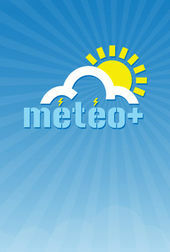 The series, Météo+, is a French, comedic drama about a staff of eccentric characters operating an independent weather network. With that notion in mind, our idea was to build mini-sequences of weather mishaps then connect it all with a series of botched forecasts. We felt viewers could relate to planning something based on a weather forecast and then having to deal with a completely different set of weather elements. To enhance this, we wanted the difference between the forecast and the resulting weather to be in some cases really over the top. Visually, the show has a unique colour palette, resulting in a retro‐like feel, so we added connecting elements to that using the vintage fans and radio. Shooting Super 16mm film, we also decided to use reversal stock for certain sequences, then processed it normally for a Kodachrome 1950s vibe. And stylistically, we wanted to keep the feel pretty organic and not use a lot of effecting or compositing. The graphic device of the floating forecasts seemed to be a great subtle touch – both clean and slick at the same time. Producer/Director: Oily Film Company Inc.
Production Studio: Oily Film Company Inc.